Don't be sad because it's over, smile because it happened! It's been almost a month since Fifth Harmony announced their indefinite hiatus, the foreseeable conclusion to the world-famous girl group whose members are now focused on solo projects. 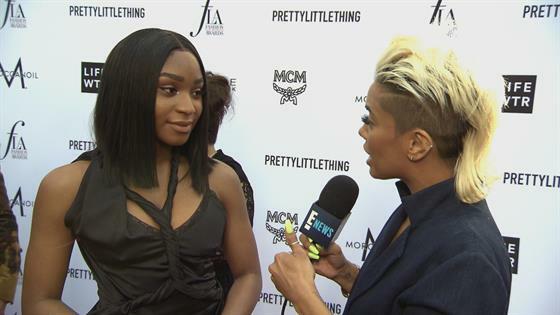 Normani is the first to admit that Fifth Harmony's breakup is "bittersweet," and says she experienced what her own fans are feeling after Destiny's Child went their separate ways in 2005. "Obviously, they're sad," Normani told E! News' Sibley Scoles at The Daily Front Row's 4th Annual Fashion Los Angeles Awards. "I was really upset when Destiny's Child broke up." The Dancing With the Stars alum added, "Being the biggest girl group of this decade, the fact that I can even say that is so surreal… I accomplished that and I was apart of it with other beautiful girls that I love so much." Normani said Fifth Harmony's split is "nothing to be sad about," adding, "There's so much to come from us individually. Who knows what will happen down the road in the future? It's all about the evolution." For now, it's all about looking toward the future while remembering the past fondly. From the 21-year-old singer's perspective, "We've been together six years now, and for me it's been the best ride of my life. I know I can speak for the rest of the girls as well. We've gotten the chance to hear so many stories from our fans and I have learned who I am through those girls as well." She told us, "It's been priceless but I am really excited to find out who Normani is in the future. We all deserve that. We worked our butts off for this moment." After Camila Cabello quit Fifth Harmony in 2016, the remaining four members—Ally Brooke, Dinah Jane, Lauren Jauregui and Normani—began exploring different opportunities while also releasing the group's self-titled third album. Normani's "Love Lies" collab with Khalid is quickly climbing the charts, Lauren has released songs with the likes of Steve Aoki and Ty Dollar Sign, Dinah has worked with French Montana on smash hit "Boom Boom," and Ally recently signed a solo artist deal. Upward and onward, right? Hear more about Normani's upcoming projects in the video above!